Get to know U16 East All Star Team Defensive Lineman Logan Taylor! 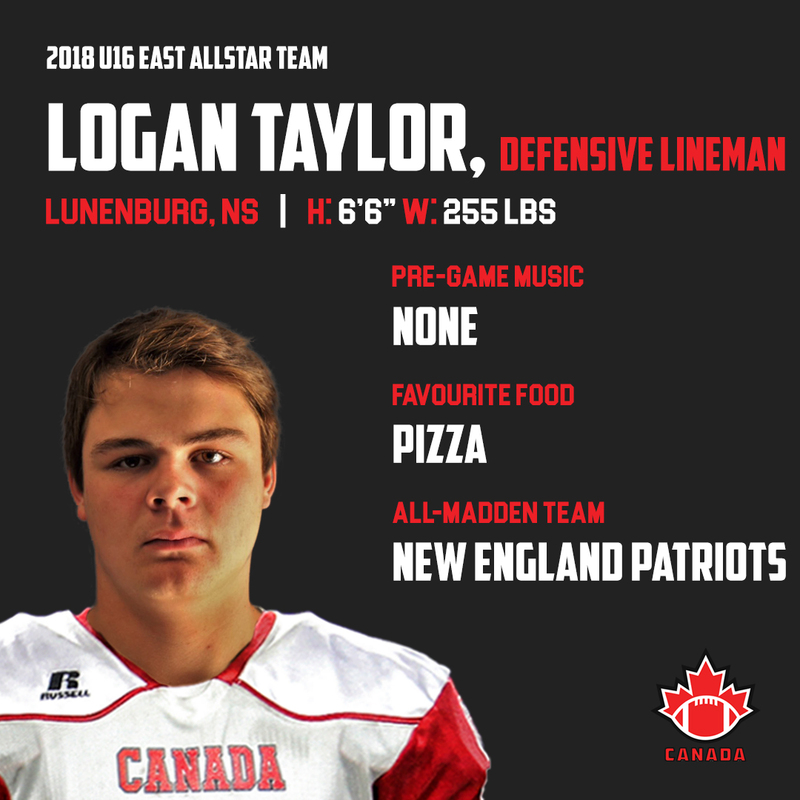 Logan Taylor is a defensive lineman from Lunenburg, Nova Scotia who will be competing at the 2018 International Bowl in Arlington, Texas as a member of the Under-16 Eastern Canadian Team. Playing soccer throughout his entire life, Taylor was introduced to the sport by his coach’s best friend. Taylor has played for minor team Southshore Seahawks as well as Sir John A MacDonald Flames of the Nova Scotia Student Athletic Federation Football League (NSSAFFL). The highlight of the defensive standout’s career was when he scored the first ever touchdown in the history of the Seahawks program. Another special moment in Taylor’s gridiron career was when he helped Team Nova Scotia win gold at the 2017 Under-16 Eastern Challenge. From the moment that he learned via social media that he made the national team, Taylor was proud that all his hard work paid off and is looking forward to representing Canada at the 2018 International Bowl. Taylor credits his parents for being the main reason he has been able to accomplish his goals on and off the field. “They’ve pushed me through a lot,” expressed Taylor. Previous story Get to know U16 West All Star Team Defensive Back Charlie DeLand!